a weblog devoted to short-but-sweet criticisms of political editorials. I am listening in the car to "Maestro" by Woodward, which is about Alan Greenspan. At one part, it talks about Alan's experience at his first private council with Nixon. Greenspan was shocked at Nixon's swearing, given Nixon's pious image. My guess is that Dubya swears as much as Nixon does. To me, Dubya's faith is just a cover to hide how really rotten his actions are. Dubya's Christian faith doesn't appear to contrain his actions in any way. Remember when Dubya was asked in the press conference before the Iraq invasion about how his faith affected his decision? It didn't have any impact on what he decided, but Dubya was going to pray to God to make things all better once we invaded. MR. RUSSERT: What’s the evidence of that, General? GEN. MYERS: Well, the evidence was before we went over, the many U.N. Security Council resolutions that stated that they had a program and that they had weapons of mass destruction they had not accounted for. They were supporting Hamas and other terrorist organizations. If you remember, Saddam Hussein was paying I think it was $25,000 to families of terrorists who would conduct suicide attacks, to the families of those who would conduct suicide attacks against Israel and, of course, there was this group of Ansar al-Islam up in northeast Iraq that was working on poisons that had actually, in fact, infiltrated into Europe and some of those plots thwarted by the British and the French and others. Where to start with this pile of lies? 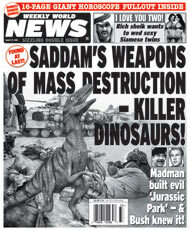 The American public was told that Iraq had weapons of mass destruction - not some stupid program. The UN inspectors in the months that they were there could find no evidence of WMD's or even a WMD program. Northeast Iraq was under control of the Kurds, not Hussein. When the BBC visited the Ansar al-Islam, there was no evidence of a poison factory. And no poison from NE Iraq was smuggled into Europe - the British found a group that was making poison similar to the poison what was supposedly being made in NE Iraq. Lastly, Hamas and other Palestinian groups are viewed by the Arab world much as the Contras were viewed by the Reagan administration. Myers tells all these whoppers and Russert accepts it all without comment. How pathetic. What I really find interesting is that when I look at all of the opinion pieces on Townhall.com, none are about the economy. None mention the federal deficit (though California's deficit gets several mentions). Can the conservative movement be out of ideas on the country's #1 issue? I agree #1 was a big accomplishment. #2 could have been a big accomplishment, except Dubya is underfunding the program. #3 started well when we kicked Al Quada out of Afghanistan. Since then, it has all gone down hill. We never captured Bin Laden, we captured hardly any senior leaders of Al Quada, we never captured any senior leaders of the Taliban, the Taliban have regrouped and battling for control of sections of Afghanistan, and Al Quada has regrouped and still is a major threat. So, the RNC can find only one real accomplishment by Dubya. I had a great vacation out in California. There, gas prices jumped up 30 cents a gallon to the 2+ dollar level on news that a gas pipeline in Arizona broke. I am sure that there are some people who believe that the oil companies are just gouging California consumers. They are the same silly people who think that the California electricity crisis was caused by power companies wanting to gouge California consumers. Or that the EPA lied to the public about air quality in Manhattan after 9/11. Or that the Dubya misled the public about the amount of WMD's Iraq had. Silly, silly people. I will post again on the 25th. Supporting our troops - not! Last month, the Pentagon sent Congress an interim budget report saying the extra $225 monthly for the two pay categories was costing about $25 million more a month, or $300 million for a full year [Out of the $4 billion a month we are spending on Iraq]. In its "appeals package" laying out its requests for cuts in pending congressional spending legislation, Pentagon officials recommended returning to the old, lower rates of special pay and said military experts would study the question of combat pay in coming months. A White House spokesman referred questions about the administration's view on the pay cut to the Pentagon report. I guess that because Dubya can't do a photo op with them while they are in Iraq, it is time for this administration to shaft them. Attorneys general in two New England states suggested Monday that the White House is behind a lawsuit that seeks to invalidate a federal report on global warming. Dana Perino, spokesperson for the White House Council on Environmental Quality, dismissed assertions that the lawsuit was contrived as "100 percent false and absurd." Perino added that the White House, which released copies of the e-mail in response to a Freedon of Information Act request, has been "perfectly forthcoming" about its communications with CEI. A message left with the Justice Department was not immediately returned Monday afternoon. The CEI’s lawsuit argues that the National Assessment of Climate Variability and Change and the Environmental Protection Agency’s Climate Action Report of 2002 should be invalidated. The latter report includes references to the National Assessment and documents similar likely impacts, Rowe and Blumenthal say in a letter to Ashcroft. "Improper and possibly illegal conduct"? I am sure all those right-wing pundits who thundered about no one is above the law will be all over this one. 401,000,000,000 x 0.121 = 48 Billion = California's share of the Federal Deficit. According to the Tax Foundation (www.taxfoundation.org), California paid $255.8 billion in Federal taxes last year -- more than any other state -- but got back only $195.6 billion in Federal spending. The difference -- a whopping $60.2 billion -- left the state never to be seen again. Who’s idea was it to invade and occupy Iraq? I am so glad that Dubya has dealt with that war issue. I am sure all of our troops in Iraq will be glad to hear it too. The saddest thing about it is that the story is as accurate as Dubya's administration on Iraq's WMD's, and both WWN and Dubya used obviously fake documents to bolster their case. Is the Bush administration turning to a televangelist doomsayer for political predictions? Apocalyptic preacher Jack Van Impe is claiming that he was contacted by Condoleezza Rice’s office and the White House Office of Public Liaison for an “outline” of his take on world events. A musical tribute to Dubya! It is hilarious! Daily Kos has reported that Fox has sued Al Franken over the title of his new book. This has got to go down as one of the worst lawsuits ever. First of all, Fox gave a huge boost to the sales of the book. Secondly, I think it would be rather easy to dispute Fox's claim that they are fair and balanced. How about how many liveral guests are invited to talk versus the number of conservative guests? How about the amount of time spent discussing Republican talking points versus Democratic? How about contrasting the treatment of errors made by the Clinton administration to the treatment of errors made by Dubya's administration? But the absolute nuts thing about this suit is the threat of discovery. Al Franken should rightly require every document about editorial decisions and every evaluation of guest and hosts of Fox's news and talk shows. If that gets out to the public, what a public relations nightmare! What a nightmare for the Fox staff and guests! © Copyright 2003 Unrelated Disney. Last update: 8/29/2003; 6:18:45 AM.